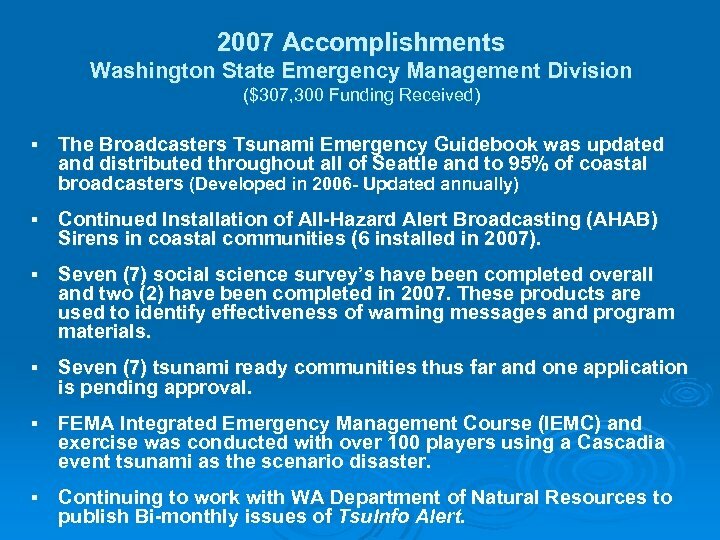 2007 Accomplishments Washington State Emergency Management Division ($307, 300 Funding Received) § The Broadcasters Tsunami Emergency Guidebook was updated and distributed throughout all of Seattle and to 95% of coastal broadcasters (Developed in 2006 - Updated annually) § Continued Installation of All-Hazard Alert Broadcasting (AHAB) Sirens in coastal communities (6 installed in 2007). 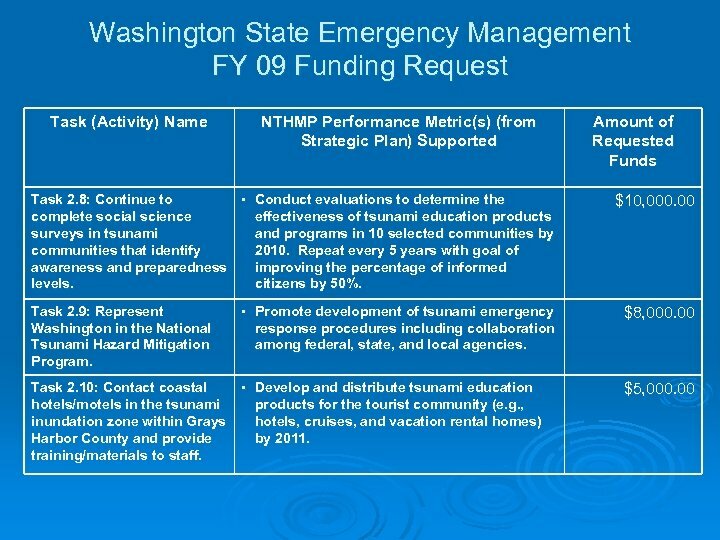 § Seven (7) social science survey’s have been completed overall and two (2) have been completed in 2007. 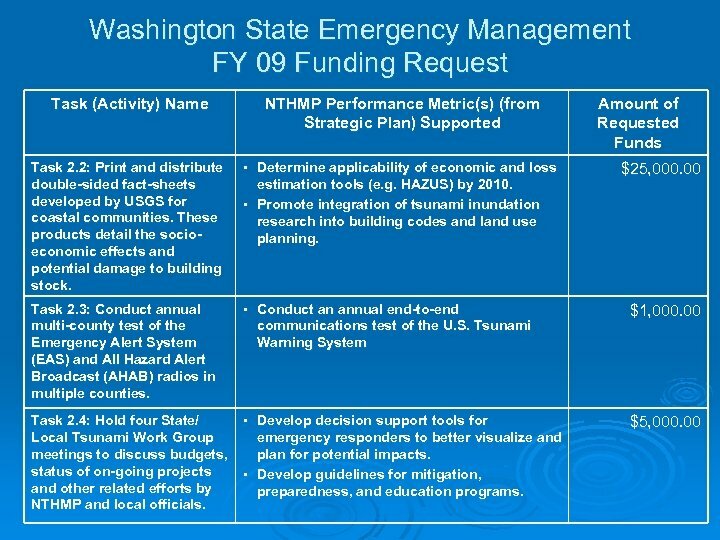 These products are used to identify effectiveness of warning messages and program materials. 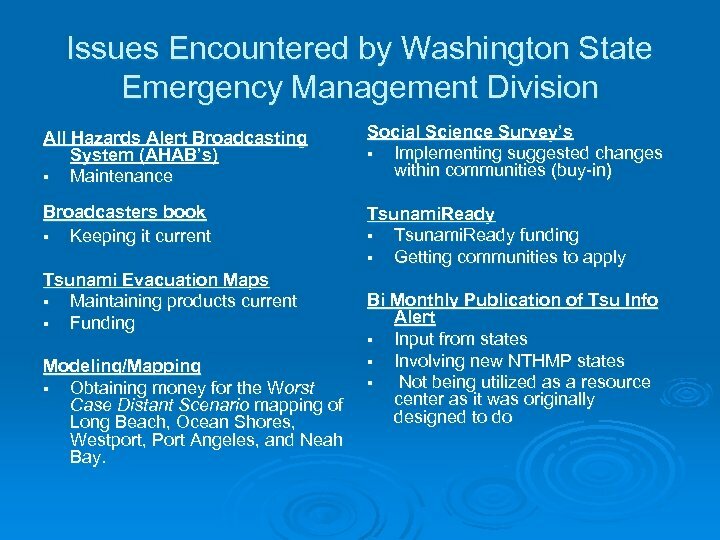 § Seven (7) tsunami ready communities thus far and one application is pending approval. 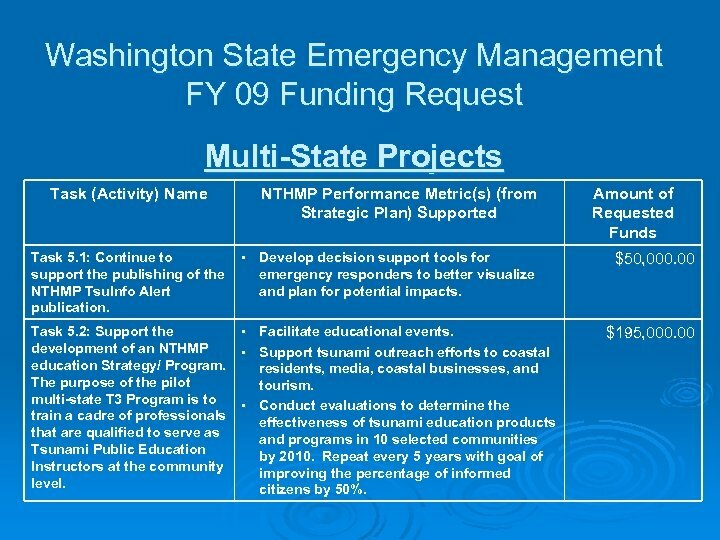 § FEMA Integrated Emergency Management Course (IEMC) and exercise was conducted with over 100 players using a Cascadia event tsunami as the scenario disaster. 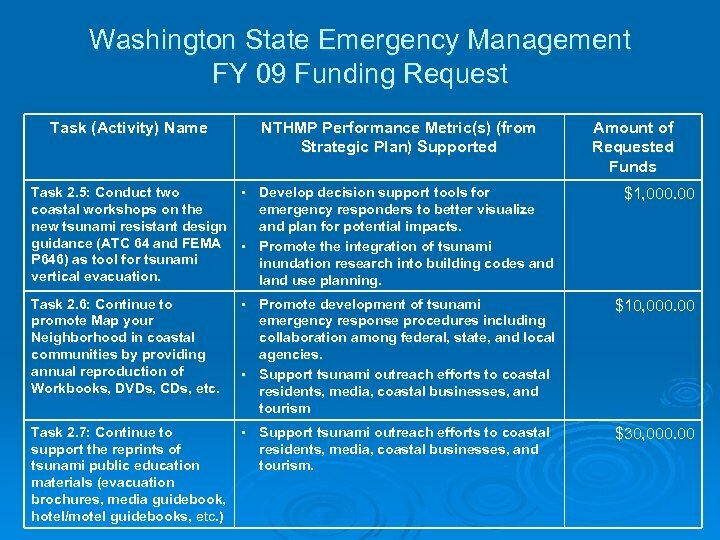 § Continuing to work with WA Department of Natural Resources to publish Bi-monthly issues of Tsu. 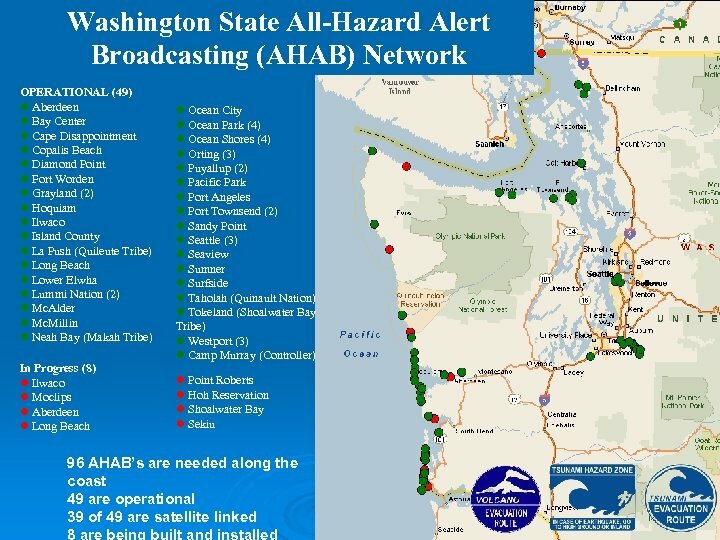 Info Alert. 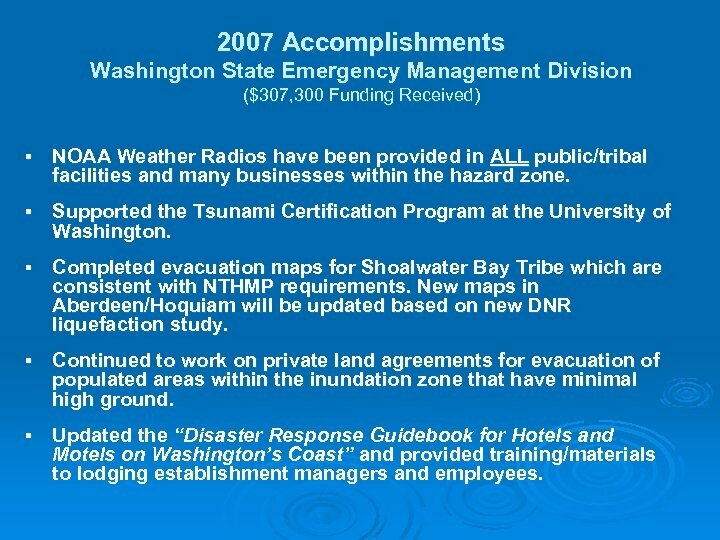 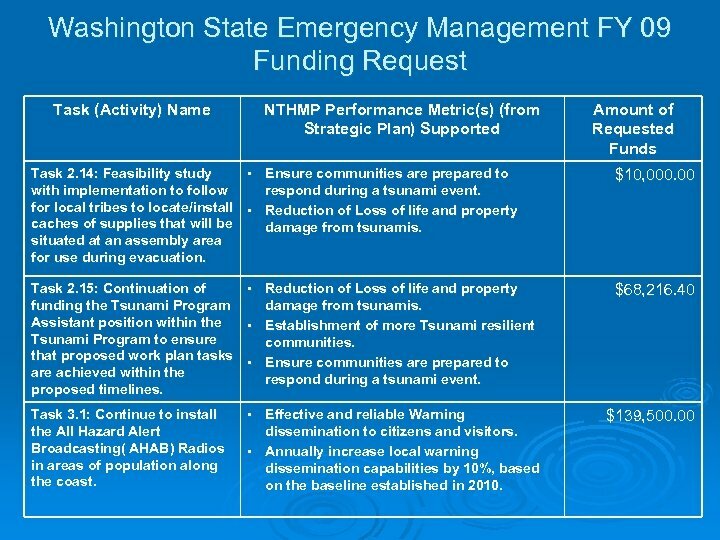 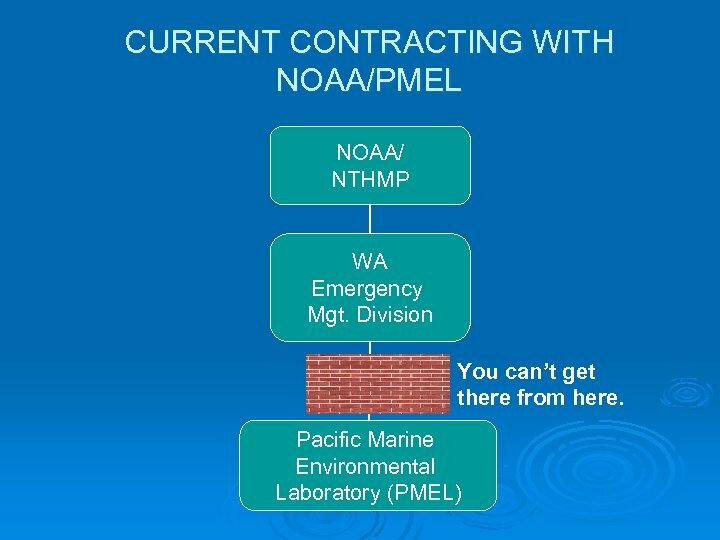 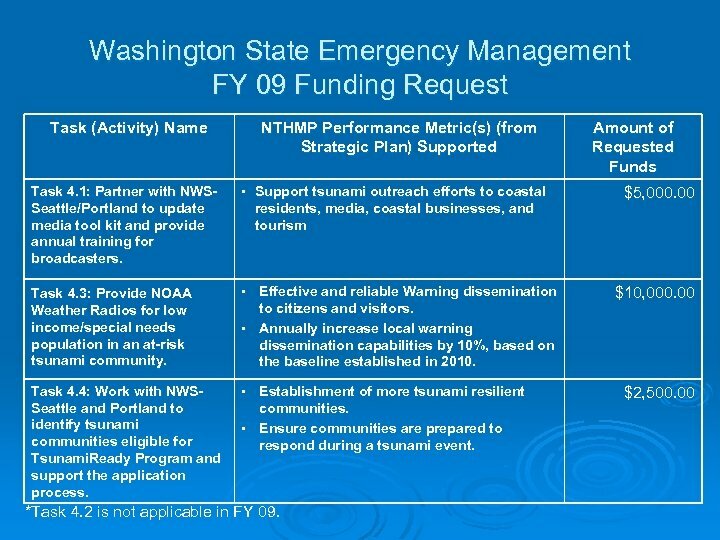 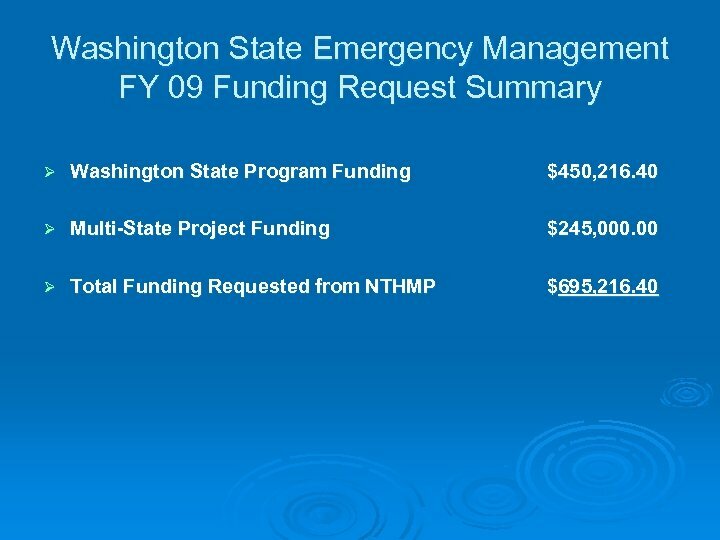 2007 Accomplishments Washington State Emergency Management Division ($307, 300 Funding Received) § NOAA Weather Radios have been provided in ALL public/tribal facilities and many businesses within the hazard zone. 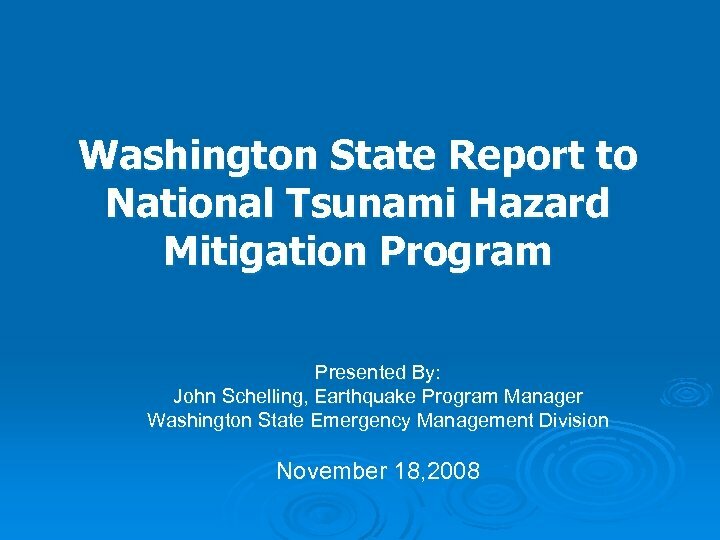 § Supported the Tsunami Certification Program at the University of Washington. 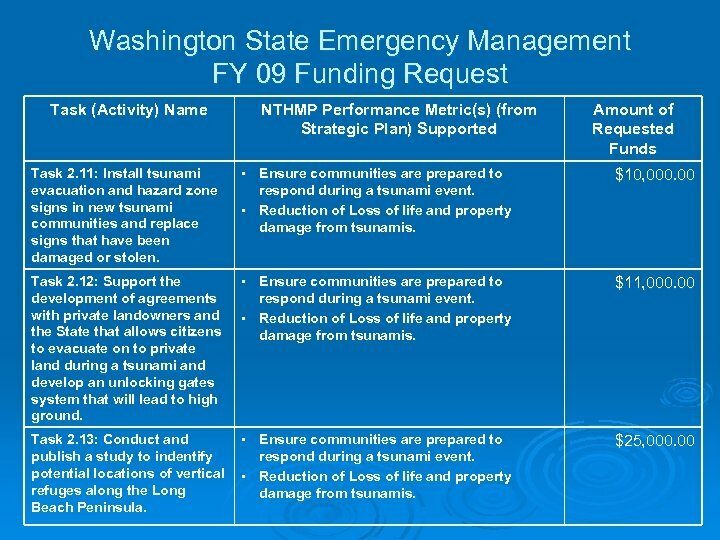 § Completed evacuation maps for Shoalwater Bay Tribe which are consistent with NTHMP requirements. 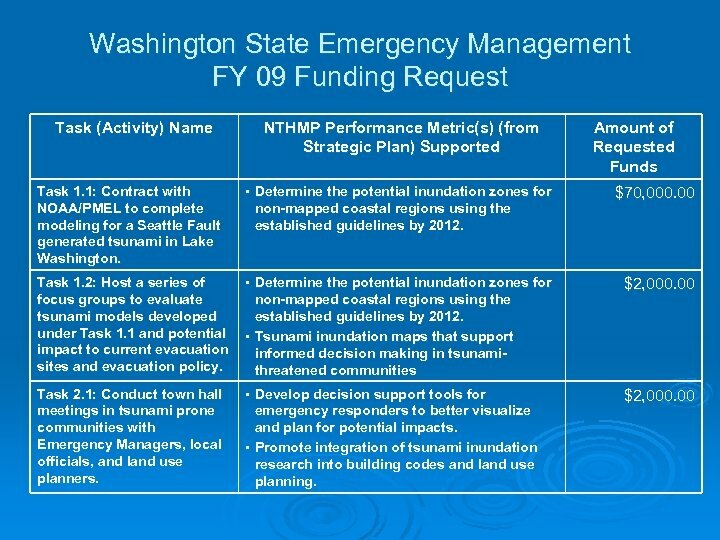 New maps in Aberdeen/Hoquiam will be updated based on new DNR liquefaction study. 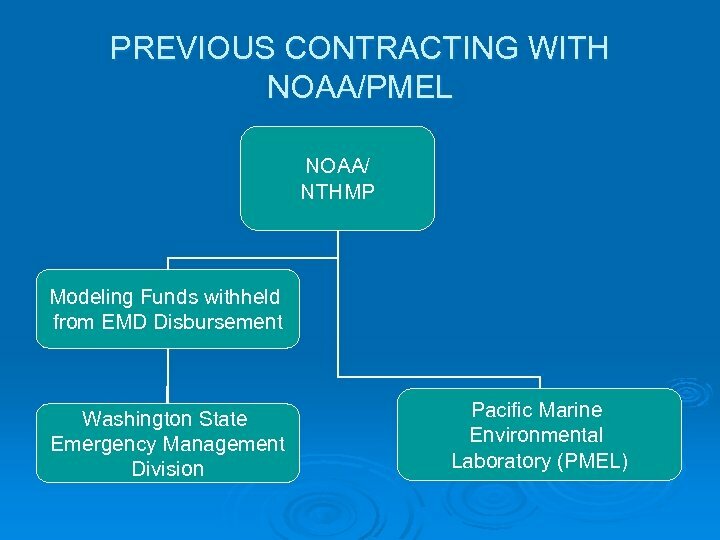 § Continued to work on private land agreements for evacuation of populated areas within the inundation zone that have minimal high ground. 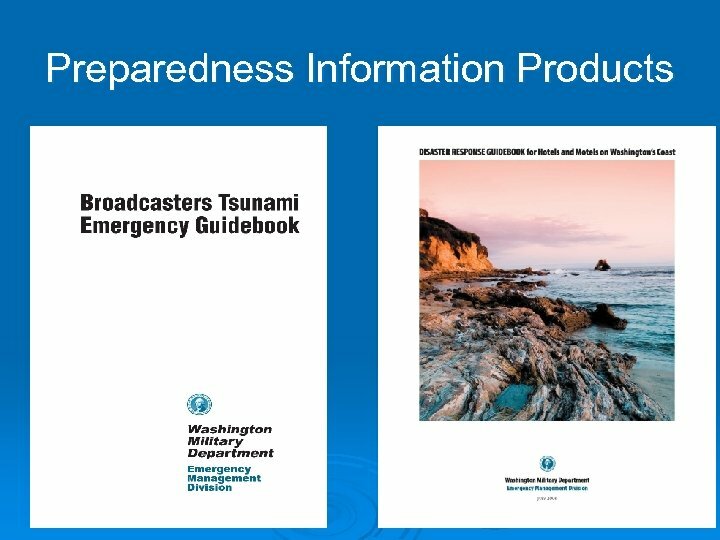 § Updated the “Disaster Response Guidebook for Hotels and Motels on Washington’s Coast” and provided training/materials to lodging establishment managers and employees.